Eating almost any plant can upset your Cavalier King Charles Spaniel’s stomach. 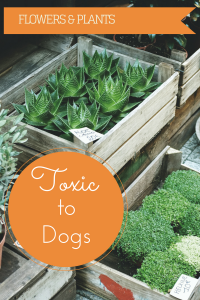 However, certain varieties can cause vomiting, diarrhea and potentially more severe problems for your pet. Call your Vet as soon as possible, or contact the ASCPA Animal Poison Control at (888) 426-4435. When your Cavalier is still a puppy, it’s best to move houseplants and flower arrangements out of reach. Whenever outdoors, be sure to supervise your puppy to keep him away from dangerous plants. By the time your Cavalier King Charles Spaniel reaches adulthood, you’ll have a good idea of his inclination to be tempted by flowers and plants. Here are some of the most common flowers and plants that may be toxic if ingested by your Cavalier. See the ASCPA’s complete list here.